Lining the insides of your plumbing pipes is a great way to stop leaks and prevent the corrosion that shortens the life of your Chicago building’s plumbing pipes. However, before installation can begin, a detailed plumbing inspection of your plumbing pipes must be performed. This inspection is designed to help you make the critical line/don’t line decision. Having your pipes lined with an epoxy pipe liner or coating is a great way to extend their useful lives and prevent further corrosion in the host pipe, but pipe lining only works well if your plumbing pipes are thoroughly inspected. The inspection is designed to determine if your current plumbing pipes will endure the pipe lining process. In some cases, the pipe to be lined may need cleaned before it can be visually inspected with a small camera. The cleaning process removes all the heavy debris from the pipe. When plumbing pipes contain a lot of debris, it can make it difficult to determine the exact diameter of the pipe and if there are any turns or bends in the pipe. A detailed camera inspection should always be performed prior to making the decision to line or not line the pipes. The small camera is mounted on a flexible metal tube and contains a light that illuminates the area in front of and to the side of the camera. The professional plumber or pipe lining expert then threads the camera through the plumbing pipe. The camera is connected to an LCD screen that the pipe lining installer can view while he is inspecting your plumbing pipes, and a digital recording is also made of the plumbing inspection so that it can be reviewed in detail later. 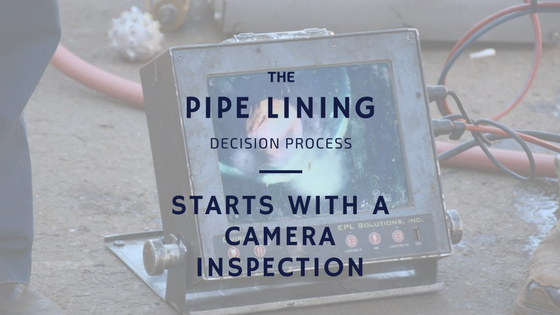 There are several things that the pipe lining expert is looking for when he performs the camera inspection. He or she is looking for any cracks, significant breaks or where the pipe has completely collapsed or disintegrated. The pipe lining expert is also looking for significant bends or turns in the pipe and any pipes that may be connected to the pipe that needs to be lined. Once the camera inspection has been completed, the pipe lining expert in Chicago can tell you if your pipes are good candidates for the pipe lining process. If they are, a pipe lining estimate will be given to you to review and talk over with your board members or the owner of your residential building in Chicago. Our pipe lining process always starts with a plumbing inspection of your pipes, which is part of our building pipe assessment. This tells us the types of materials of your plumbing pipes, their corrosion levels and their ages. Next, we determine if your pipes can be lined with a pipe liner or epoxy coating. If they can, part of our building pipe assessment involves giving you a detailed estimate for trenchlessly refurbishing your plumbing pipes. If you choose Nu Flow as your pipe lining company, we will schedule a time to reline your pipes that works well for your Chicago high-rise residential building. Our professional pipe liners will arrive on-time with the tools to line your pipes. Your pipes will be thoroughly cleaned to remove debris and corrosion and the inside walls of the pipes will be prepared to access the epoxy liner or coating. Then, we will prepare the pipe liner or coating and insert it into your pipes. Once the liner or coating has cured, a second camera inspection is performed before the water is restored to your building. 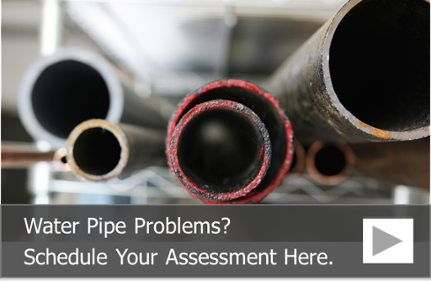 To schedule a building pipe assessment or to learn more about the pipe lining process, call us at 815-790-9000.